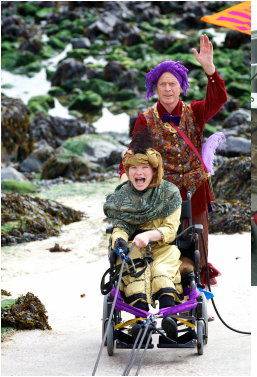 Visitors to St Ives on Friday 20th September were amazed to see a noisy, colourful procession, where Kerry, who usually uses a wheelchair, was ‘queen for a day’ and was carried around St Ives in a handmade Sedan Chair. 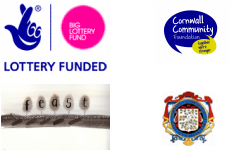 This performance by Shallal Dance Theatre, in collaboration with artist Jo Mayes, was devised as part of the Remapping St Ives Project, in order to highlight the problems that many people have in getting around our towns, in a light-hearted and engaging way. The performance began with ‘queen’ Kerry ‘testing a harbour slipway for wheelchair access’ with the support of stunt and rigging specialist David Greeves. Kerry performed the nail-biting stunt, pulling herself up the slipway, using climbing equipment, with the support of colourful Shallal performers and cheering on lookers. 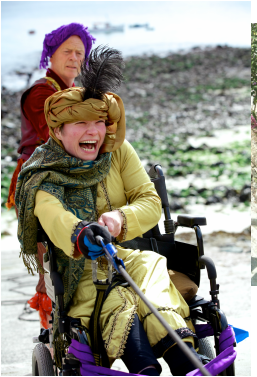 Shallal performers then transported Kerry around the town, stopping to make small dance and theatre performances on the way to St Ives town hall to celebrate the opening of the new disabled access ramp to the Visitor Information Centre. Terry, 72, also made an ascent of Mount Zion, a steep cobbled street which is particularly challenging for those with mobility impairments, with the support of three other performers and a climbing rope! Feedback and ideas for changes in the town were taken, as part of the performance, by local artist Karen Foss; inviting people to tie their ideas and suggestions to her costume! All feedback from the project and initial survey will be fed into the town plan, hoping to encourage the town to continue with improvements such as the new ramp at the Town Hall. As St Ives Councillor, Andrew Mitchell point out, “The impact isn’t going to be immediate…just bring it to people’s attention…you just need to build momentum up and this is a good start”. We currently have an exhibition around this performance in the foyer of the St Ives Library. It's on until the end of October 2013. Why not pop in and take a look if you're passing? Closed on Wednesdays! Our next step is to hold a meeting of people who are interested in thinking about ways to support positive developments within St Ives for those with mobility challenges. If you are interested in being involved, please contact us above or speak to Councillor Andrew Mitchell.